Studio James is a proven luxury Interior Design firm focusing primarily on high-end residential homes. Our specialty is creating warm and comfortable spaces with a modern aesthetic that is tailored to each client, digging deep to reflect their values. We understand that your time is valuable, and that communication is the key to success. With clientele spanning worldwide, our methods build a strong relationship between designer and client. We eliminate the stress of the design and build process by handling all necessary details, coordinating with architects and contractors, and problem solving on your behalf. With our complete turn-key service, you will walk into your custom designed home where you can start living and begin reconnecting in your space immediately. 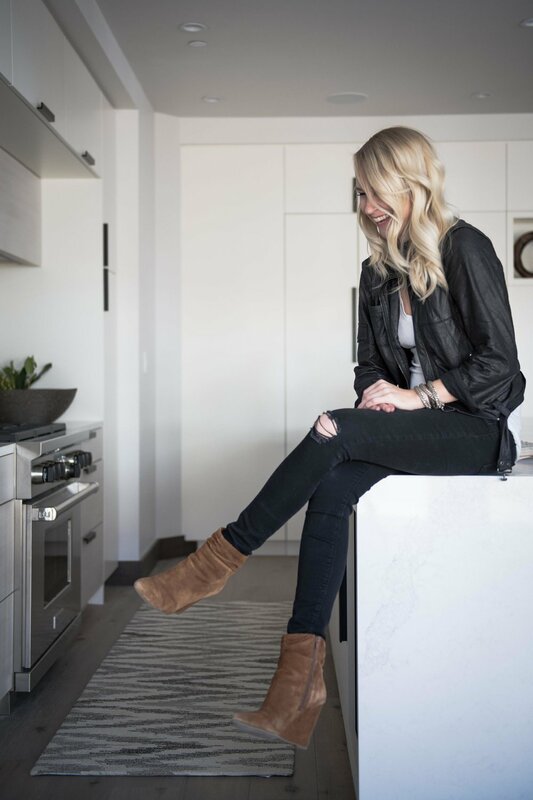 Studio James is led by Founder and Lead Designer Victoria Jones – an award-winning interior designer based in the Vail Valley of Colorado, with over 10 years experience working with and managing high profile projects. Victoria began her career working with one of the world’s leading interior design firms, providing valuable experience and knowledge that allows her to fulfill her unique clienteles expectations. Her accolades include recognition by Colorado Homes and Lifestyles Magazine, as a “Top 5 Under 40" design professional. To stay ahead of the trends, Victoria travels to design trade shows worldwide collecting new ideas and inspiration. Her firm is supported by a team of leading architects, builders, contractors, kitchen and bath designers, and other trade professionals, along with an international network of vendors and suppliers. Penelope, Studio James office mate and Victoria’s soul dog. You can find Penelope at the office keeping us calm and eliminating the stresses of the day. She’s not a fan of sweater’s and prefer’s scarves in the cold winter months. Our process is collaborative. It starts with listening and understanding your needs and desires. Then we get visual with inspiration and lifestyle images, creating a feeling that develops into a style. After that, we get technical. We’ll present drawings, 3d renderings, interior elevations, and floor plans. Once plans are finalize, we coordinate with our trusted team of architects and builders to bring the concepts to life. Lastly, comes delivery and installation of furnishings, accessories, and household items so that you can start living in your new space immediately.